A secret, three-day bachelor party that includes a trip to Kentucky to watch the Derby is just what John Welles and Claude Willoughby have in mind for their best friend, Sam Feldman. They believe they’ve given the bride-to-be and Sam’s mother the slip, but the ladies are on to them. Claude, whose father used to breed races horses in Kentucky, undoubtedly suggested their entertainment. Even though the three friends don’t gamble, they are excited about the opportunity to attend the running of the Kentucky Derby. Unbeknownst to the trio, they picked a good year to go. 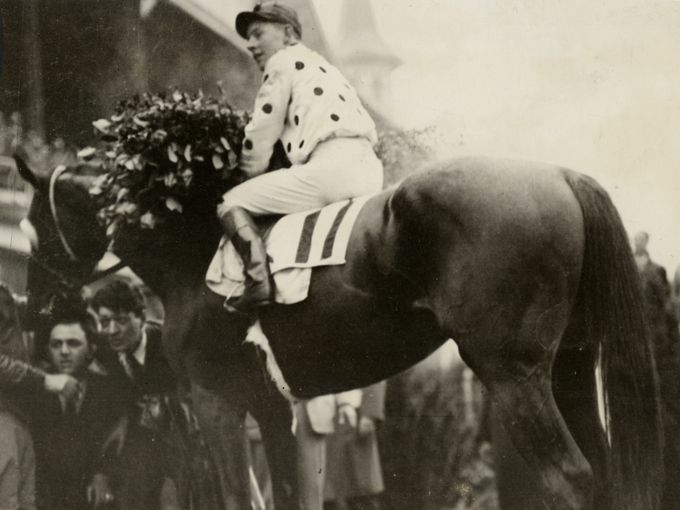 In 1935, the thoroughbred racehorse, Omaha, owned and bred by William Woodward Sr., owner of Belair Mansion and Belair Stud Farm, was on his way to winning the Triple Crown starting with his performance at the Kentucky Derby. Of course, horses don’t get to the finish line by themselves. 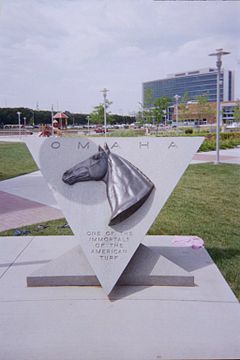 The year Omaha won the Kentucky Derby, jockey William “Willie/Smokey” Saunders was aboard for the ride. Saunders learned to ride in Alberta, Canada, and Montana. He earned his first win at Tanforan Racetrack in northern California on April 14, 1932, and was tutored in riding by the famous jockey, George “The Iceman” Wolfe of Seabiscuit fame. The outbreak of World War II, as well as weight problems, interrupted Saunders’ career. He joined the Army, serving in the Pacific theater for four years. During his service, he contracted malaria which led to considerable weight loss, a silver lining to an unpleasant condition for the jockey who returned to racing when the war ended. Saunders finished his career as a jockey in 1950, and he served as a racing official at various tracks in New Jersey, Florida, and Illinois. He worked as a trainer then as a placing judge. His final honor in the world of horse racing came in 1976 when he was inducted into the Canadian Horse Racing Hall of Fame. Unfortunately for Saunders, the same year he won the Triple Crown, media attention of the less desirable sort also followed him. 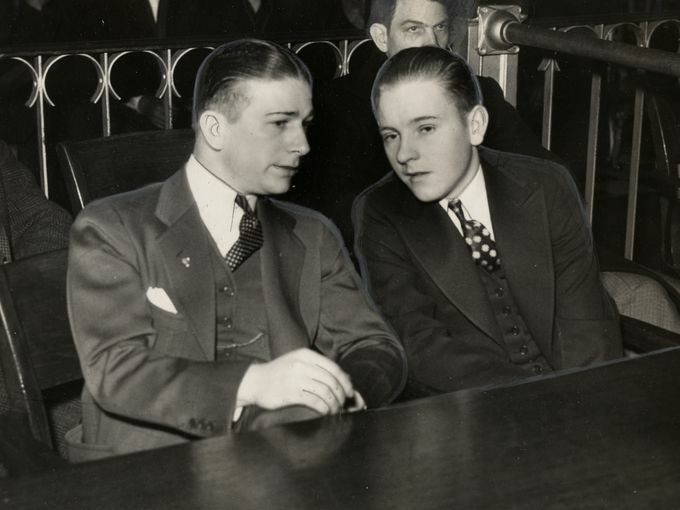 In October of 1935, Saunders faced the accusation of accessory to murder of Mrs. Evelyn Sliwinski. The case cast a bad light on Saunders riding career, and he never rode in another Kentucky Derby. His final days were spent in Florida where he died of cancer at the age of seventy one. Sometimes the attitudes toward various aspects of writing boggle my mind. The two most recent are short stories are not worthy of our attention and the omniscient point of view has fallen out of favor. No sooner will I come across one of these narrow-minded statements, I’ll discover someone being recognized for doing them brilliantly. The same people who make these statements will then laud said brilliant person, and the rest of us flock to be like them. Really? Today, I’m going to focus on the short story issue. I cannot image chucking any form of writing because the proverbial they have declared it no longer fashionable. What is this, writing high school where we all want to be in the popular clique? I am bothered by the fact that frivolous trends, like those that, in my opinion derived from my perspective, define fashion, would also dictate the world of writing. Are we going to allow ourselves to be misguided and limited by believing that everybody should be writing in the same style and format? Or am I wrong in believing that writers are above this? True, we can grow in our chosen art form, but it would be to our detriment to forget, abandon, or leave untried other styles and forms of writing. There are many reasons why the short story should be explored by the novelist and poet. In turn, writers of short stories will benefit from attempting a novel or poetry. Perhaps this stems from my being a proponent of cross training in the work place or the fact that short stories are where I first tried my hand at writing. 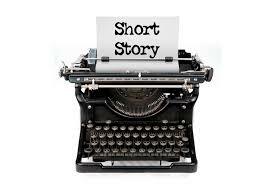 In any case, I hope you enjoy the following posts on why you should be writing short stories. Your feedback on these articles, as well as critiques of my own writing under the Read & Relax tab of my blog, is most welcome. Very, Really, Suddenly, Amazing, Awesome, That, Started: what do these words have in common? They should be avoided when writing. This isn’t something I’d be too concerned with during a first draft, but when you go back to edit all the bad writing, these are the words to remove. We’ve all slipped them in from time to time because they’re overused in every day language. After reading the post from Writer’s Circle, I recalled a passage where I used suddenly. It had been bothering me, but I couldn’t come up a worthwhile replacement word or phrase indicating the action. As soon as I finished reading, a workable solution presented itself. Some time away from my manuscript and this gentle reminder spurred my creativity to stretch beyond the commonplace. One place I allow myself some leeway on using the seven, above-listed words is when writing dialog. Working in the court reporting industry taught me that even educated people don’t speak as well as they’d like to believe. Dialog sounds more realistic if is isn’t as perfect as prose. Also, don’t replace one bad word with another poor choice. I discovered that I replaced very with extremely much too often when speaking. What sounded good to my ear prompted yet another scan of my manuscript to ensure that I hadn’t done the same thing in my writing. I found five instances, and I’m currently in the process of editing them. Another great thing about cleaning these words out of your writing is that it’s the first, small step to the editing process which often feels overwhelming. Getting rid of them provides a building block to better editing which in turn means better writing. 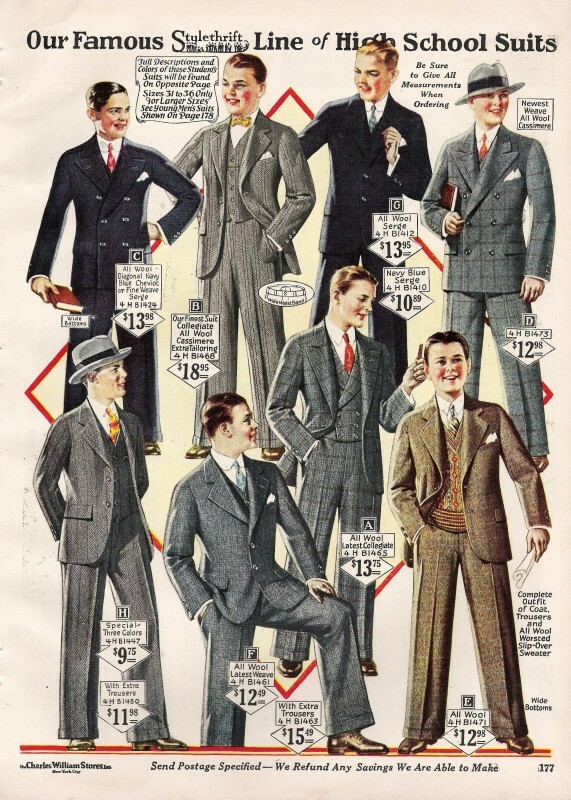 In yesterday’s blog post, When the Clothes Really Do Make the Man, I provided a link to a website for excellent information regarding vintage clothing. Today’s trip down Research Road stops at a post by Liz Michalski on Writer Unboxed. In her article, Clothing Your Characters, Liz offers insight into why the clothing you choose for your character is important in how it relates to character development. After reading Liz’s article, I stepped back for a moment to see how well I portrayed clothing in my novel, The Secrets of Dr. John Welles. There were a couple of scenes where the clothing my characters wore was important to the story, however, I may use the tips Liz suggested to create a more tactile feel to other parts of my story. While writing my novel, The Secrets of Dr. John Welles, I found that food played in to what I wrote more than what they wore. I guess that’s because I enjoy feeding real people and have a tendency to do the same with my fictional characters (Edible Fiction). However, there was one special scene that took place in June of 1925 where I needed the perfect outfit for my protagonist, John Welles. I didn’t want to clothe my main character based on what I thought was correct or what I’d seen in movies. To be off by even a few years would have proven to be embarrassing. My goal was to create an authentic outfit, so I sought the help of someone with more fashion experience than I possess. During my search for clothing appropriate to the time period, I came across Debbie Sessions’ website, The Vintage Dancer. Sure enough, Debbie had a section devoted to clothing from the 1920s. 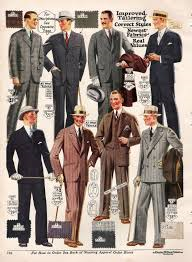 Fortunately for me, she went one better when she answered a personal e-mail resulting in the follow article, 1920’s Teenagers Men’s Fashion – Suit, Shoes, & Hats with Pictures. Thank you, Debbie, for dressing John so perfectly for his high school graduation. It is Christmas morning, December 1917, and young John Welles is celebrating with his family. Their festivities are halted for a moment when John’s often absent, always inebriated father walks into the kitchen. John and his three siblings hold their breath until their stepmother, Collie, prepares a plate of fried eggs and a cup of coffee and sends him back to wherever he spends his days. 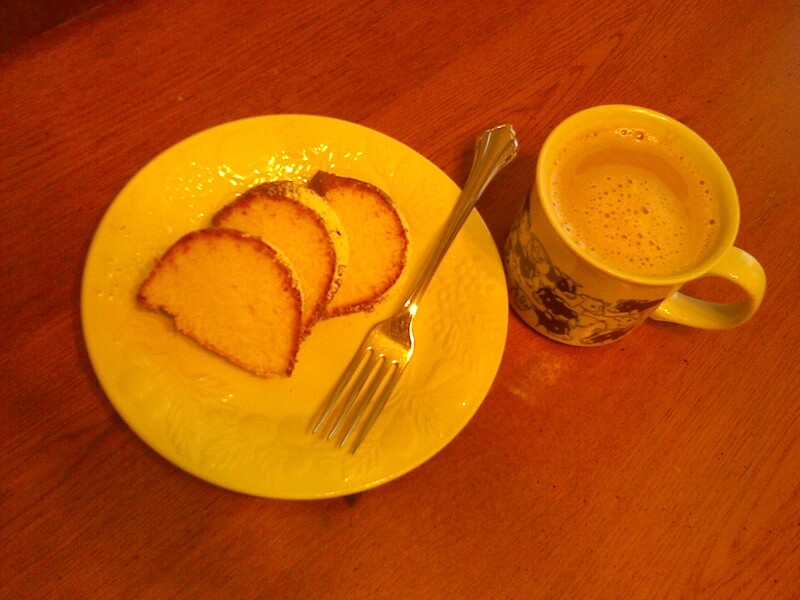 As a surprise for her stepchildren, Collie made pound cake and hot cocoa. She’s not the type to serve dessert for breakfast but makes an allowance for Christmas. 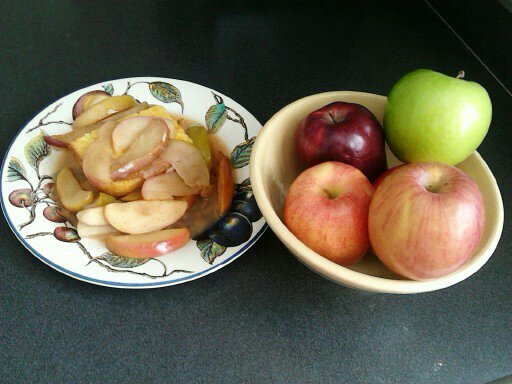 The following recipe is the one I had in mind when I wrote the scene above. 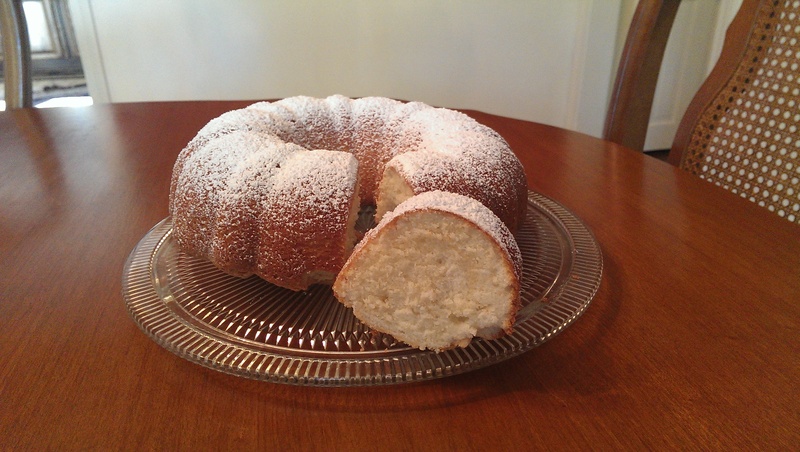 I first tasted this particular pound cake at a work function. My co-worker, Cheryl Pandrea, really has the magic touch when it comes to making this recipe. The cake is rich, moist, and delicious. It’s perfect served with the cocoa recipe on my blog. In a large bowl, cream the butter and the sugar. Add the baking soda and mix. Add the eggs two at a time and mix thoroughly after each. Add the sour cream and mix thoroughly. Gradually add the flour a half cup at a time, mixing well after each addition. Grease and flour a bunt pan, be sure to get all the fluted edges. Bake the cake for 1 – 1 ½ hours or until golden brown. 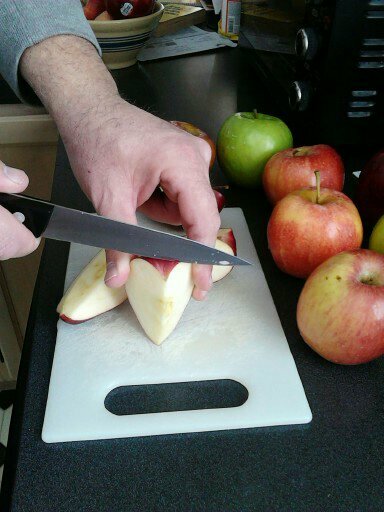 A tester inserted should come out clean. Turn the cake out on a cooling rack. 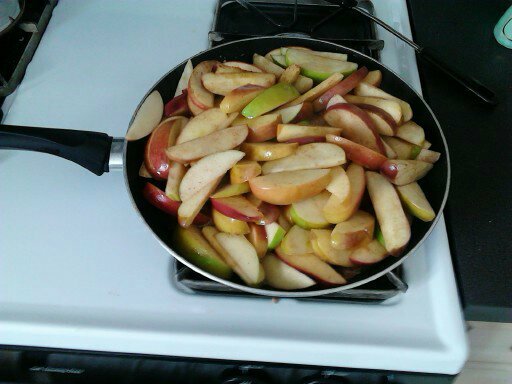 Let it cool until just warm or room temperature, then serve. I remember the moment I understood that my writing is art. It came after watching a YouTube video of Neil Gaiman give a speech to a graduating class. Prior to that, I believed art was created by masters who worked a lifetime producing museum quality pieces. What a thrill to know that I am creating art. But my discoveries didn’t stop there. 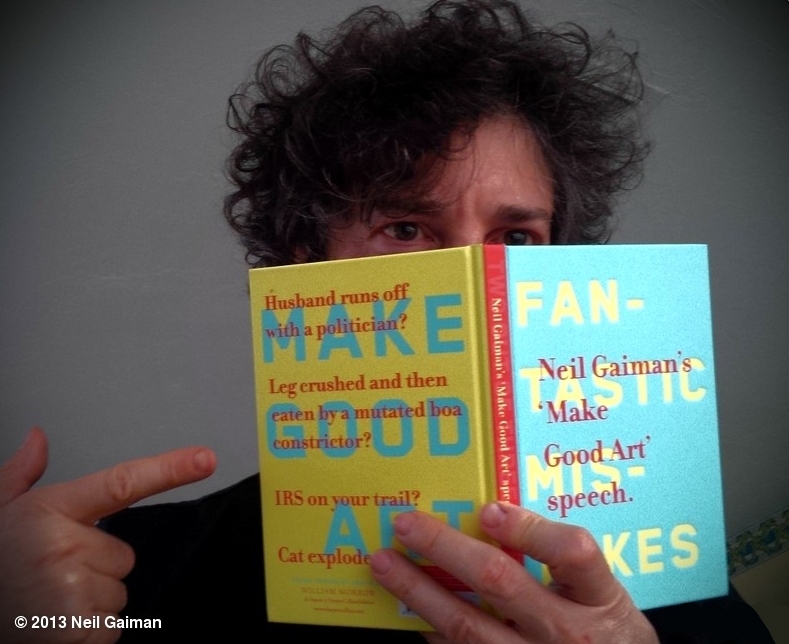 As I set out to, per Neil’s advice, make good art, I found that what I wrote kept changing. Fortunately, it changed for the better. I learned some things that I’ll definitely employ and other things that I’m sure will not work for me. One thing I came across, and have blogged about before, is pantsing versus outlining. Let me clarify: I hate labels. Once you label something, you’re obligated to define it. After you define it, you must maintain it. This leads to the messy business of judging someone who doesn’t agree with your label. That causes more labeling of those who aren’t like you. What I’m saying is, while I still adhere closer to the pantser end of the spectrum, by the end of my novel, I discovered I’m somewhat of an outliner, too. Go ahead and create a label for that, if you dare. My outlines probably don’t conform to what one might find in a writing workbook or to those created by other authors. However, I have my color-coded, multi-tabbed spreadsheet of information created so that I don’t to forget all the wonderful ideas that flooded my head when I first decided to write a novel. Unlike traditional outliners, my ideas aren’t all solidified prior to the beginning of my writing; I like to surprise myself, leave a little wiggle room, add some things and remove others. So, maybe I’ve been producing something a little closer to an outline than I originally thought? I can think of two outliners who are probably happy-dancing right now. I will never judge anyone for the way in which they choose to create their work of art. That would be like criticizing someone for being a hands-on learner while you’re a book learner. In return, I’ll ask the same of everyone else toward me. At the end of the day, we’re all artists. 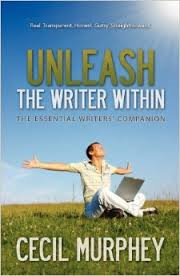 Today, I’m stocking my Writing Toolbox with a piece from NY Book Editors called Planning to Outline You Novel? Don’t. This one tips the scales toward pantsing. Whatever style you choose to create your novel, just remember that it has to meets your needs.